If you have clear plastic retainers or Invisalign aligners, you know that removing them can sometimes be a challenge. These tools help make it easier! The OrthoKey was designed by an Invisalign patient to easily remove Invisalign and clear plastic retainers. 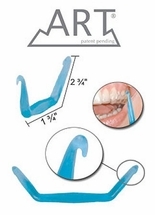 The ART tool has double hooks for loosening and removing your retainer or aligner tray from both sides at the same time. The Outie Tool features two different ends: one for loosening the top aligners or retainers, and one for loosening the bottom aligners or retainers. Both of these tools make it easier and faster for you to remove your clear appliance, and help you keep germs out of your mouth, because you are not using your fingertips to remove your appliances.